BIG-PUNCHING Lee Haskins says he will simply hit too hard for challenger Jason Booth in tonight's British bantamweight title fight at Bristol's City Academy. 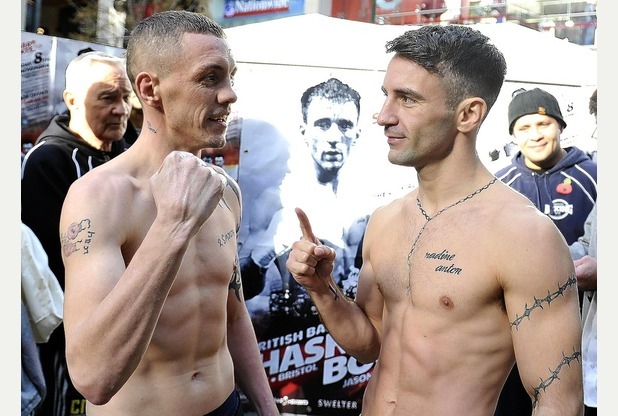 Lockleaze-based southpaw Haskins, 30, makes the first defence of the title he won by stopping Martin Ward in five rounds at the same venue in April. And he is determined to produce a show of strength for the Eurosport TV cameras, which will beam the contest live across the continent. Vastly experienced and a smooth operator in the ring, Nottingham veteran Booth, 36, knows he is supping in the last-chance saloon. While acknowledging the challenger's ring nous, Haskins insists he will be altogether too powerful for the Midlander. "He is very tricky and knows the game inside and out," said Haskins, who has his sights set on the European title. "Jason has been in boxing for a long time and knows his way around a ring. "You only have to look at his record to realise he knows how to stay in the ring for 12 rounds. Going the distance will be no problem for him. "The last time I watched him fight was before I even knew I was going in with him. He's a good technician, but I think I will beat him. I'm a different fighter these days and I reckon I'll have too much power for him. "I'm at my peak as a fighter and I'll be too sharp and too fast for him." Haskins stamped his authority early on in his last fight and intends doing the same against Booth. If the opportunity to put the former British and Commonwealth champion away early presents itself, he is confident he has the punching power to win inside the distance. But Booth is a great survivor and the Bristolian is prepared to go the 12-round championship distance if he has to. He said: "I have more than one fight-plan. I want to get to him straight away, impose my authority and show him who is boss. "Obviously, I'd like to get the job done quickly and get him out of there if the chances arises, but I'm not going looking for an early finish. "I'll mix it up and be aggressive when the chance presents itself and keep moving and make it difficult for him to catch up with me at other times. "I'm confident in my ability to hit hard at bantamweight, but I also trust in my training and I'm prepared to go the distance if I have to." Doors open at 6.30pm and boxing is scheduled to start at 7pm, with the show going live on Eurosport at 7.30pm. The fight card will also feature the next generation of Bristol boxers, among them Hassan Karkardi, Dane Kelly, Wayne Ingram, Krystian Nadolski and Dan Sarkozi. Tickets are on sale, priced £60 (ringside), £35 (unreserved) and £10 (under-16s), and can be secured by calling the box office on 0117 949 6699.